"He did an amazing job and kept everyone laughing the entire time!" "Jeremy helped promote the event and drew a huge crowd. He put on a great show for our donors and even donated money back to us!" "Our evening would not have been near the success it was without you." "Jeremy was very helpful in making sure we had all the details lined out beforehand and arrived early to our event to allow enough time to set up...I recommend Jeremy for any event similar to ours." "His communication was timely and clear, he was available for questions throughout our decision-making process. Overall we found Jeremy to be entertaining, effective, and a great value and would recommend him for a wide variety of events." "I received lots of positive comments regarding your show. I appreciate your willingness and heart to provide entertainment that was both humorous and appropriate content. It was a great evening of food, fellowship, and fun!" "Jeremy had us laughing and enjoying good, Christian humor in no time. Involving the audience was a special touch on an already great performance." 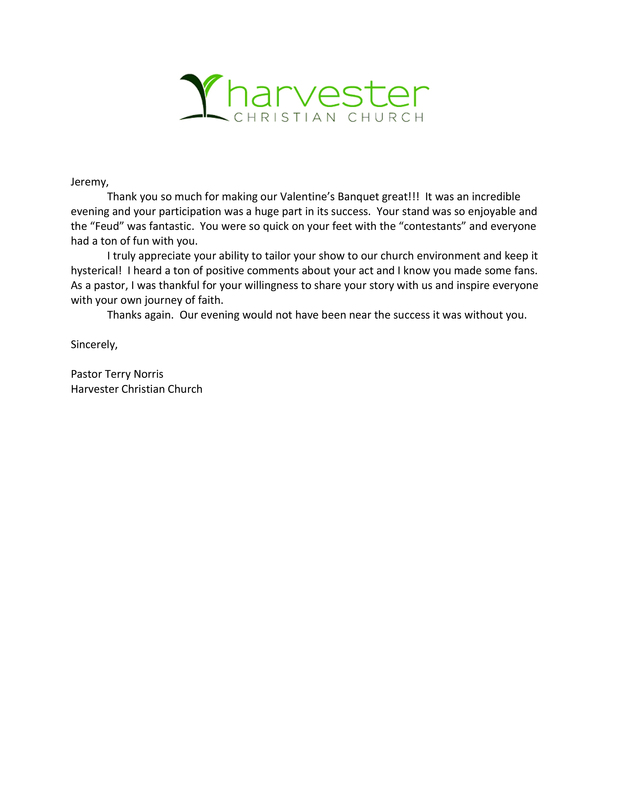 "I would highly recommend Jeremy for any church related event." "Everyone was laughing and enjoying the evening! Jeremy's accessibility to everyone and light-hearted conversation added to his appear and left our people wanting to see events like this one happen again!" "Jeremy did a nice job and it was a good break for our staff from the traditional Christmas program. I would recomment Jeremy for a wide variety of audiences." "Multiple generations of people represented at this gathering, and it seemed as if everyone could relate with his humor on some level...Jeremy understood our context and conducted his routine in a professional and clean manner." Christian Comedy Shows and Fundraisers: "At the Crossroads of Laughter & Grace"
A lifelong Christian, Jeremy has been getting laughs in churches since he was a little boy. It all began when he shook his 78 year old Pastor's hand with an electric buzzer. He never looked back. Now, he performs his shows at churches for fundraisers, volunteer appreciation, youth groups, Christmas parties, revivals, outreach events, Vacation Bible School, Mother's Day, Men's retreats, and just about any reason you can think of. The best part is that all of his comedy is 100% clean, inoffensive, and hilarious. Its a great way to introduce people in the community to Christ in an easy going, non-intimidating manner. It can also be a great way grow a congregation closer to each other and closer to Christ. Jeremy is a Christian, so he knows what is and is not acceptable for performance material. Many comedians simply say they understand, and later on Jeremy hears the terrible stories the next year when the churches say they should've just hired Jeremy. Do NOT risk you or your church's reputation by hiring a comedian for your church that isn't a Christian! Plus, Jeremy ends his shows with a jaw-dropping, inspiring testimony, designed to motivate your congregation to move closer to God. 2. Your church members and guests in a live gameshow (if reqested). 3. Jaw dropping, inspiring testimony. A great idea for your ministry, school, charity, non-profit, and more! Looking for a fundraiser that's easy to plan, not much work, statistically is a top grossing fundraiser method, AND attracts new clients and donors that have never heard of you? This is it!! Jeremy's fundraiser show is clean and inoffensive, but powerful and energetic enough that the unchurched crowds have fun too. Plus, studies show the biggest donations come after the audience has been loosened up! And if you'd like, Jeremy is willing to do media interviews to help promote the show AND do the "ask" at the end of the night. The same comedy show that Jeremy performs at theaters and comedy venues throughout the country. This is great for Christmas parties, revivals, volunteer appreciation, and outreach events. Jeremy - a father of two who has been married for years - presents a show full of jokes and stories about marriage and dating. A perfect fit for a special date night, such as (but not only for) Valentine's Day. Jeremy's tailor made show specific for youth groups. This fun and high energy performance is great for any youth group event or Vacation Bible School. A comedy performance with lots of references and stories specific to the gender Jeremy is performing for. Ideal for Women's ministry, Men's groups, Mother's Day and Father's Day events.